The Perks of Grilling by the Pool - SE Pool Supply & Chemical Inc. SE Pool Supply & Chemical Inc. Tired of toiling in the kitchen while all of your party guests are having fun in the other room? Don’t retreat into your kitchen like a hermit! Join the party! Make the most of your pool season (which, as we know, can be all year long in Florida) by cooking up your favorites al fresco. Just get your grill on by the pool and watch the magic unfold! Grilling by the pool is an unbeatable idea for so many reasons. 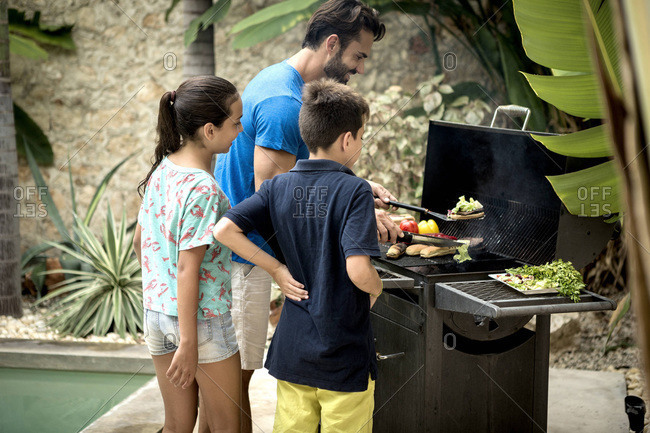 Aside from making entertaining for large groups easier and way more fun, grilling outside for your guests can enable you to keep a watchful eye on your kids in the pool from a short distance. And, trust me, your kids would much rather be frolicking in the pool than hanging out in the house while you entertain. Not to mention that your possibly pasty pallor will transform into sun-kissed skin. Or, if you prefer, you can have a nighttime pool party and wow your guests with your grilling prowess under the stars and amidst tiki torches. Plus, grilling by the pool allows you to get creative with your fare. Did you know that you can actually grill watermelon and just add mint and feta cheese to create a delicious and refreshing poolside salad? Boom! Finally, we cannot forget that poolside grilling also enables you to easily facilitate the dreaded cannonball to soak any deserving pool party guests or children at your discretion.